An original theatre show for children featuring the songs of Barry Louis Polisar performed at the Sheridan Opera House in December, 2011. 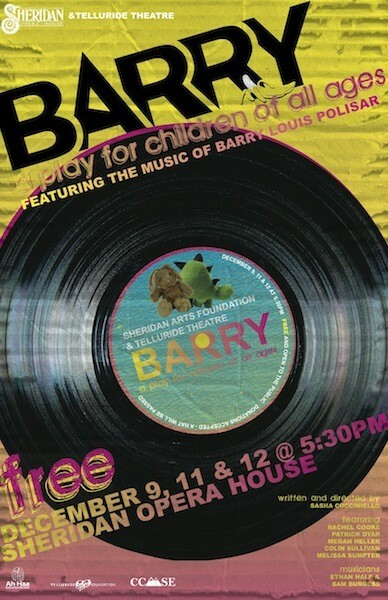 Barry Louis Polisar has been writing and recording music for children since 1975. One of those children who grew up with his songs was Telluride Theatre’s own Sasha Cucciniello. After playing some of his music for Colin Sullivan, Colin secretly contacted Sasha’s childhood hero to see if he could get permission for her to write a play using Barry’s songs. Barry said yes. “Barry has been incredible throughout this process — trusting and generous. He has lived up to my idol status and this play is a tribute to him.” Using his songs, Sasha wrote a musical play for children of all ages. The story follows a boy named Barry through an ordinary day where lots of extraordinary things happen. But that is only part of the story – there are surprises, silliness and lots and lots of amazing music. The cast includes Rachel Cooke, Patrick Dyar, Megan Heller, Colin Sullivan and Melissa Sumpter. During the rehearsal process the playwright and cast have been working closely with veteran theatre musicians Ethan Hale and Sam Burgess to bring Barry’s songs to life.